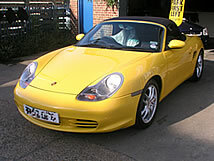 This service is specifically to deal with problems such as dull and faded paintwork, swirl marks, micro-scratch's, light scuffs, key scratches, damage caused by bird droppings and minor vandalism on exterior paintwork, things that normal car valeting cannot remove. 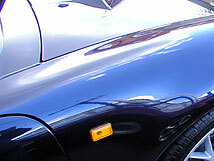 We can restore even the most faded and dull paintwork to a 'nearly new' condition. It's also great for reducing small scratches which haven't broken the base coat, such as those caused by Car Washes and hedgerows.T "Thank you Clean Image"
Please note, with these services we are following a safe formula of buffing. 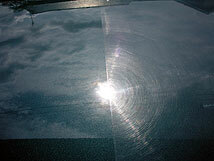 It will remove oxidization and reduce scratches. For deeper scratches and blemishes, see further down the page. 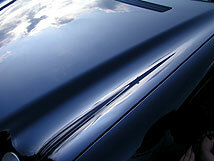 Bird droppings contain corrosive compounds that can etch your paintwork leaving nasty stains. We can improve (70% or more) or remove these stains my means of wet sanding the effected area and then buffing it with a rotary buffer. 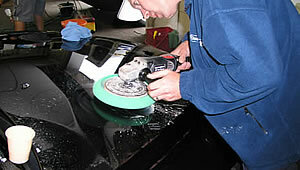 This kind of repair can also be used for other forms of stain such those caused by egg, acid and chemical burns. It may also be possible to remove or improve the appearance of deeper scratches with this method depending on how deep they are. In the case of key scratches, often they are only deep in places so that it is possible to remove a percentage of the length of the scratch. Other areas which are a bit deeper can be reduced, meaning that while the scratch still remains, by buffing it and softening the edges it is far less noticeable, especially in areas below the level of the door handles. Any remaining areas can be touched in and polished, also making them less visible. 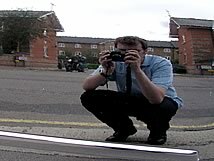 There is no magic answer for key scratches - we cannot make all of them invisible but we can often make such a significant improvement that when weighing the costs, our service is preferable to a respray. wet sanded and then buffed out. Some marks are difficult to remove - and we may not be able to remove them completely. But we are willing to try if you will let us! If we are unable to make an 80% improvement then we will not charge you. 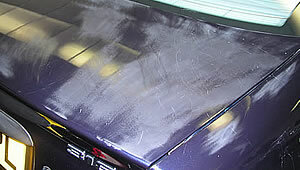 If we can make a 80-95% improvement, but you feel that you just can't live with with the imperfection, and need a repair & paint at a car body repair shop, then we will give your money back - all you have to do is show us proof that you had a body shop repair within 30 days and we will give you a full refund. You really don't have anything to lose! This car had several deep scratches and was covered in swirl marks and looked rather tired. 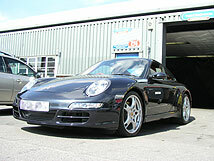 Amazing results can be had with paintwork correction. Click on the thumbnails below to see lots of examples and before and after photos. 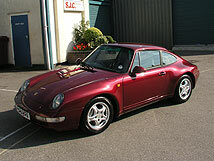 Perfect for a 2-20 year old modern classic that you want to look like new again, but don't want to have a respray. Please see the articles below for examples of our work. 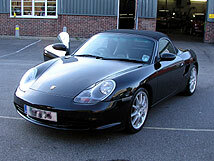 Prices are from £250 to £580, plus you will need to have a valet with this service. No kidding! You are welcome to see for yourself. The Green Bonnet featured in this article still hangs in our reception area. Please drop in and see it, touch it, feel it. 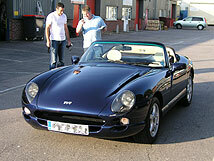 Why not call us up for a chat about making your car like new again. Willy Winterfalk tells about the AllPad buffing system.